One of the things that I teach in my Bootcamp for Artists seminar is guerrilla tactics for reducing framing costs up to 80-90% from custom framing costs. One valuable asset here are A.C. Moore stores, with their significant set of ready made frames at generally affordable prices, often coupled with weekly sales. 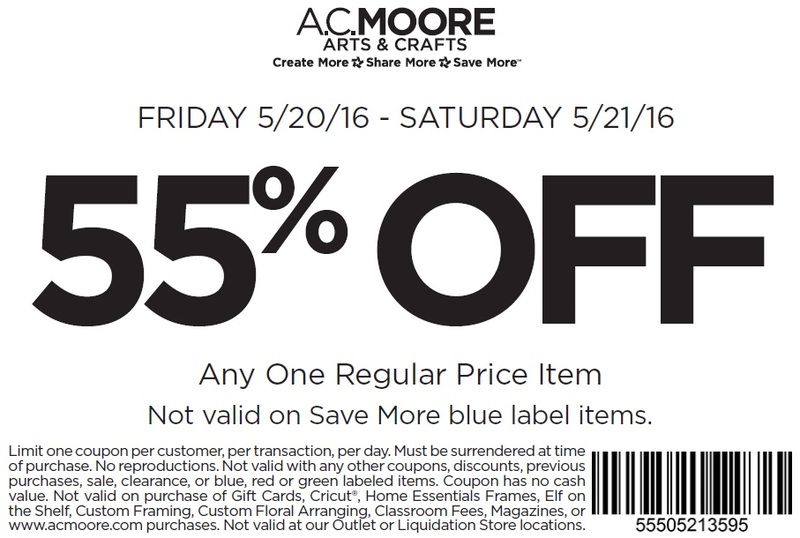 Moore's is also a prodigious coupon-generating factory, and quite often you get a coupon that proudly announces "55% off any regular priced item." To me, being a pedantic Virgo, "any" means that all items in the store which are not on sale are discounted 55%. The small print on the coupon notes several exceptions to "any." 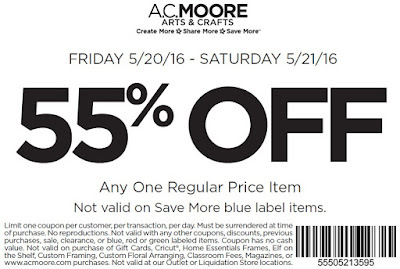 Prior to the "any" coupon, I had received an email blast from A.C. Moore's proudly announcing "Today Only: 20% Off Everything‏." And so I rush to the store, thinking that "everything" means.... ahh... everything! "Everything" is understood by the most casual observer to mean everything in the store... and thus I was surprised when I went and made a large purchase that there were many things at the store where it didn't apply -- that is dishonest advertising to say "everything" and then you get to the store and Essential Frames, clearance items, etc. are NOT part of "Everything." This, of course, bugged me and thus I contacted A.C. Moore to explain to them that by using the word "everything", the implication was that any item on the store was eligible for the discount. Thank you for contacting A. C. Moore Customer Care. We apologize for the misunderstanding about the 20% off coupon from our email subject line. The details of this coupon are printed on the actual coupon, where it explains that the 20% off is on your regular and sale price items, and lists excluded items. Your detailed feedback is greatly appreciated as it allows us the opportunity to address this type of situation for future visits. I have added 500 points to your rewards account (the equivalent of making a $50.00 purchase) for the inconvenience. We understand your position and we appreciate your feedback about this. We will forward your feedback to our marketing team to take this into consideration for future email coupons. And I am grateful, and it is an inconvenience to load a cart with 30 Home Essential frames on two separate occasions, only to find out that they are not eligible under the "any" descriptor in the 55% "any" coupon, or under the "everything" descriptor in the 20% coupon. What's the solution? Can Moore's get out of this borderline deceptive coupon by simply using an asterisk after the word "any" and "everything"? At least an asterisk raises an alarm that there are limitations. Five gets you ten that the winner is Amy Sherald (also the most recent winner of the 2016 Smithsonian Outwin Boochever Portrait competition). In fact, the very talented Ms. Sherald is having a great year! 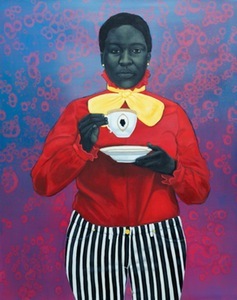 Amy Sherald earned a Bachelor of Arts from Clark- Atlanta University where she became an apprentice to Dr. Arturo Lindsay. Sherald received her Master of Fine Arts in painting from the Maryland Institute College of Art. After graduating, she secured a prestigious private study residency with well-known Norwegian painter Odd Nerdrum . In 2008, she attained an artist residency assistantship at the Tong Xion Art Center in Beijing, China. Her work has been exhibited extensively including solo exhibitions at Richard Demato Gallery in New York, University of North Carolina at Chapel Hill, and the Reginald F. Lewis Museum in Baltimore, MD. Sherald’s work is also featured in the permanent collections of the National Museum of Women in the Arts, The Smithsonian Museum of African American History and Culture, the US Embassy in Dakar, Senegal, and the D.C. Commission of Fine Arts. Sherald is also the winner of the 2016 Smithsonian Outwin Boochever Portrait competition. She is currently living and working as an artist in resident at the Creative Alliance.